Dona Bertarelli and Yann Guichard today introduced the Spindrift 2 crew for the team's attempt on the Jules Verne Trophy, for sailing non-stop around the world. To undertake the Jules Verne Trophy is as much about the human adventure as a technical and sporting challenge. The men and women working alongside Dona Bertarelli and Yann Guichard at Spindrift racing have been preparing for this record attempt for almost three years now. Their target of course is to sail around the world non-stop in less than 45 days, 13 hours and 42 minutes, the record set by Loïck Peyron and his crew in 2012 on Banque Populaire V, a previous incarnation of their boat. The Franco-Swiss team decided to use the same 40m trimaran because they believed that the boat could be further optimised, a task that sailors, engineers and technicians in the team have been working on ever since. After countless hours of work at the boatyard and 40,000 nautical miles of racing and training, the Spindrift racing-prepared trimaran is now set to go. The team will officially go on stand-by on 19 October as they await an ideal weather window. With just a few days left until that important date, Bertarelli and Guichard have announced the 12 crew who will join them on their journey through the world’s most hostile oceans. Most are multihull experts; some have an Olympic background; others, experience in offshore challenges; but all are familiar with the trimaran and share the team’s values and mindset. The crew members know each other, having competed together with Spindrift racing or taken part in other projects. Some have already circumnavigated the globe, be it in the Jules Verne Trophy or the Volvo Ocean Race. In the photo above they are - from left to right, at the top : Thierry Duprey du Vorsent, Thomas Rouxel, Sébastien Audigane, Antoine Carraz, Sébastien Marsset, Xavier Revil, François Morvan. From left to right, at the bottom: Yann Riou, Dona Bertarelli, Yann Guichard, Jacques Guichard, Christophe Espagnon, Erwan Israël. Plus Loïc Le Mignon - not in the photo. Two challenges lie ahead for the skipper Yann Guichard, who has dedicated his career to elite multihull sailing and has made more than 15 transatlantic crossings. First, to complete his first around-the-world sail, and second, to take charge of the boat and the crew on board. “I must concentrate hard to make the right choices at the right time, whether during early or final preparations or out on the water,” he says. He set up Spindrift racing with his partner Dona Bertarelli, and the couple are jointly responsible for the team’s day-to-day development and management. Bertarelli is an exacting, determined businesswoman, actively involved in several foundations, including the Bertarelli Foundation for marine conservation, and she has been involved in the Jules Verne Trophy project from day one. She first took up offshore multihull sailing on Spindrift 2 in 2013. Since then she has listened, observed, honed her skills and grown in confidence, and is now ready to spend more than 40 days at sea, following in the footsteps of Tracy Edwards (1998) and Ellen MacArthur (2003) in attempting to become the first woman ever to beat the record. One of Spindrift racing’s goals is to perform well all year round on the different circuits on which it competes. To achieve this, a core group of sailors accompany Bertarelli and Guichard throughout the year on the D35, Diam 24, GC32 and the maxi-trimaran. From that core group, Christophe Espagnon, François Morvan and Xavier Revil - whom Yann met during his Olympic preparations - will be part of the Jules Verne Trophy crew, as will the skipper’s younger brother Jacques Guichard, who is the team’s sailmaker at North Sails. Xavier Revil has already sailed around the world on the same boat as part of Loïck Peyron’s record-breaking crew in 2012. Another member of Peyron’s crew was Thierry Duprey du Vorsent, who was brought in to the project last winter as Boat Captain because of his experience over the last 15 years, including his role in the Banque Populaire V record. 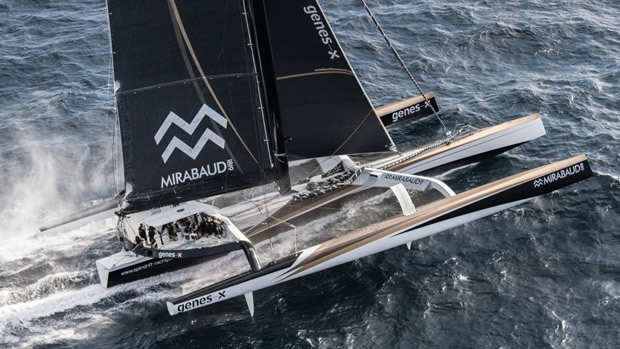 Antoine Carraz was also part of the previous record and who know Spindrift 2 the best, having spent three years as technical manager for the trimaran and for the design office. This will be his first circumnavigation and during it he will be keeping a particularly close eye on the boat. Three other crew members – Thomas Rouxel, Sébastien Marsset and Erwan Israël – were part of the team that beat the Route of Discovery record from Cádiz to San Salvador on Spindrift 2 at the end of 2013, so their experience on the boat will also be important. Two of three have just competed in the 2014–15 Volvo Ocean Race: Rouxel for the Chinese Dongfeng Race Team and Marsset with Team Alvimedica. None of the three, however, took part in the Southern Ocean leg, so they will have their sights set firmly on rounding Cape Horn. Erwan Israël was Yann Guichard’s router for the 2014 Route du Rhum and last winter joined Dongfeng for the Sanya-Auckland leg of the Volvo Ocean Race. After several months as Spindrift racing’s performance analyst, Israël will be navigator for the Jules Verne Trophy, working alongside the skipper at the chart table to determine the best route. Yann Riou also has experience in the Volvo Ocean Race: the former electronics specialist was Groupama’s media crewman during their victorious 2011–12 campaign and in the latest edition of the race he performed the same role for Dongfeng Race Team. Riou will be the first full-time onboard reporter for a Jules Verne record attempt. Dona Bertarelli and Yann Guichard have called up two crew with vast experience sailing multihulls at high speed in the Southern Ocean. Brest-based sailor Sébastien Audigane will take on sailing’s most famous record for the fourth time, having been part of Bruno Peyron’s successful bid on Orange II in 2005 and the unsuccessful attempts by Olivier de Kersauson in 2002 and Franck Cammas in 2008. Loïc Le Mignon, meanwhile, was part of the Jules Verne attempts by Groupama 3, including the successful one in 2010. Onshore support will be provided by world-renowned meteorologist and offshore sailing router Jean-Yves Bernot, who has prepared and routed some of the world’s best single-handed sailors, notably Francis Joyon's solo non-stop round the world and transatlantic records. Bernot has also previously competed in the Whitbread Round the World Race and has been a crew member for various teams in different countries. Finally, there are two reserves - Thomas Le Breton and Simone Gaeta - both of whom have trained on the maxi-trimaran this season and are ready to stand in if a crew member has to drop out. Preparations on the trimaran are drawing to a close. On Monday 19 October Spindrift 2 will officially be on stand-by in Brest, a port famous for major record attempts, located just a few miles away from the start line off Créac’h lighthouse on Ushant. The routing team will analyse weather data several times a year in search of a good opportunity to launch the assault on the legendary course.